Poison is a status effect in the Mario role-playing games and in Puzzle & Dragons: Super Mario Bros. Edition. Poisoned characters or enemies will take a few HP worth of damage every turn for a number of turns. In Super Mario RPG: Legend of the Seven Stars, Poison is one of the few conditions that the party can inflict on enemies. Bowser is able to do this with his Poison Gas attack. When poisoned, the affected character turns purple. "Poison Spell", used by Smithy in Box Head form. In Paper Mario, whenever Mario is poisoned, he turns green and loses 1 HP per turn, for three turns (excluding an M. Bush's poison bite, which lasts for two). The player can negate this effect sooner by using items such as Super Soda or Tasty Tonic, using Eldstar's Refresh, or winning the battle. Guarding against an attack that inflicts poison or equipping the Feeling Fine badge blocks it completely. Being afflicted with a poison attack will have a green "splash" effect accompanied by a hollow moaning sound. The player cannot inflict this status ailment against enemies. Poison functions the same way in Paper Mario: The Thousand-Year Door as it does in the first game, with Mario's partner being able to be inflicted with Poison as well. The duration of this status ailment is nine turns. While the player is unable to inflict this status ailment against enemies, the only way to do so is to inflict confusion against one beforehand (with an attack such as Head Rattle), and the confused enemy might, if they have any poison attacks, poison other adjacent enemies with such attacks. Eating a Poison Mushroom causes this status ailment as well as cutting the user's HP in half. In Super Paper Mario, the heroes lose one HP at a time after about every five seconds. They must use a healing item to cure the poison. Otherwise, the poison will also go away after a while if left alone. Eating a Poison Mushroom will cause this status ailment. The Long Last Shake is the only healing item that isn't able to cure poison. In Paper Mario: Sticker Star, Poison can also be transferred to other enemies. Poisoned characters in Paper Mario: Sticker Star lose HP equal to 10% of their Max HP. Being poisoned can be caused by eating a Poison Mushroom or by lining up three Poison Shrooms on the battle spinner. One of Gooper Blooper's attacks include spraying a poison cloud-like stream at Mario, inflicting both Blind and Poison. In Paper Mario: Color Splash, the only way for Mario to get poisoned is if he gets hit with purple paint during the battle against Roy Koopa. In Mario & Luigi: Superstar Saga, the Mario Bros. can turn white or pinkish purple in order of the severity of the poison. Some enemies and bosses in that game such as Fuzzbushes, Viruses, Puffer Cheeps, Elite Pestnuts, Glurps, Hermie III and Trunkle can poison Mario or Luigi if their attacks are not properly countered or dodged. If they turn white, they lose 2 to 6 HP every turn whilst turning pinkish purple will take away 4 to 12 HP every turn. 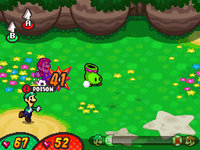 In the remake, the affected bro is surrounded with purple clouds, and the status is referred to as 'Poison' and 'Max Poison' respectively, but while Poison deals 10 HP per turn, Max Poison deals 25 HP per turn. In Mario & Luigi: Partners in Time, poison is indicated by that character's color scheme darkening to purple. The victim loses HP every turn unless they faint, use a Refreshing Herb, until the battle is over, or until the effect wears off. The damage the Poison condition induces becomes greater over time; with the number starting at five or ten, an additional five damage is added every turn. Enemies and bosses like Spiny Shroopas, Princess Shroob and Elder Princess Shroob can inflict this status. In Mario & Luigi: Bowser's Inside Story and Mario & Luigi: Bowser's Inside Story + Bowser Jr.'s Journey, poison works the same way it did in Mario & Luigi: Partners in Time. Enemies like Sockops and Sniffle Thwomps can poison Mario and Luigi. Additionally, Bowser has a similar affliction called Sick, which can be inflicted by Sniffle Thwomps and Blizzard Midbus. The status effect returns in Mario & Luigi: Paper Jam after its absence in Mario & Luigi: Dream Team, working the same way it did in past games. In Puzzle & Dragons: Super Mario Bros. Edition, the player's team can be inflicted with this status if hit with the "Poison Mist" attack from a Bone Piranha Plant, or "Poison Smog" from a Big Bone Piranha Plant. When poisoned, a small purple skull appears on the lower-left corner of the top screen and the team's total HP goes down every turn. Only after clearing a battle or continuing after losing a life will the ailment wear off. The Awoken Skill "Poison Barrier" from Big Bone Piranha Plants or from "Blooper & Cheep Cheeps" enemies can reduce the chances of being poisoned, depending on the level of their Awoken Skill. In Super Mario-Kun, Mario and Goombario get poisoned after a Putrid Piranha expels bad breath on them. Mario & Luigi: Dream Team is the first RPG not to have this status effect. Instead, the Mini status effect occurs. Poison is also not present in Mario + Rabbids Kingdom Battle, though the Vamp status effect appears similar to it. This page was last edited on March 5, 2019, at 15:06.